The accident attorneys at Worby Groner Edelman are experienced in representing victims of fall down accidents. Winter means snow and ice on sidewalks and roads. We know you’ll be careful, but it you or a loved one has been injured from a fall on snow or ice, call us. You may have a claim against the owner of the premises or the municipality where you fell, and you might have as little as ninety days to file that claim. Depending upon the exact circumstances of your accident, the municipality where the accident occurred may be responsible. However, most municipalities have laws to protect the municipality from liability, and many maintain laws that shift responsibility for sidewalk snow and ice to the owner of the premises in front of which you fell. You can help prevent falls by wearing proper footwear during the winter months, and to be more aware of where you are walking. Also, try not to be outside at all when snow or ice is falling. 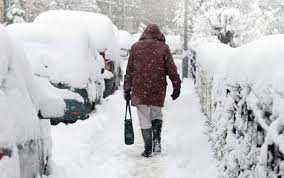 It’s obviously more dangerous to walk during a snowstorm, and pursuant to a legal doctrine called the “storm in progress” rule, municipalities and landowners are protected from liability if you fall during a storm or a short time after. But if you fall after the snow stops and a reasonable amount of time to clear the sidewalks has passed, you could have a claim. You may wonder what a building owner can do to prevent ice from accumulating. It’s a good question, with a simple answer. The first thing the owner must do is to shovel or remove the snow that has already fallen. Second, the owner should apply salt or another ice melting substance to the sidewalk. This not only melts the ice, but gives you, the pedestrian some traction upon which to walk. Third, if there are very significant areas of snow and ice, the building owner can place cones or barricades around the area where the ice has remained to warn people not to walk in that area. Also, a building owner is not permitted to take a “see no evil” approach – the law requires an owner to inspect the area to determine if it’s reasonably safe for pedestrians. Many building owners, both commercial and residential, are safety conscious and responsible. However, some property owners simply do not follow the law. They don’t bother to inspect the area to determine whether it’s safe to walk, and don’t take the time to clear snow and ice as required. They don’t use simple common sense, leaving the public exposed to a dangerous condition. Very often, there is what is referred to as black ice which means ice that is very difficult to see and that is what causes many falls. Ironically, a small amount of effort on a building owner’s part can save years of misery for pedestrians trying to go about their daily business. So be careful out there, and take simple precautions to avoid a fall down accident. But, if you have been injured in a “slip and fall” accident on snow or ice, at Worby Groner Edelman, our White Plains accident attorneys have over one hundred years of experience in this type of case. We’ll answer all of your questions, help you work through the insurance process, and do everything to help protect your rights. Remember, there is never a fee unless we are successful.